If you are looking for a truly luxury handbag, one of the most exclusive leathers of all is ostrich leather. Soft and luxurious it is also a tough leather that keeps its good looks for many years and its elegantly patterned texture, spotted with the characteristic quill follicle polka dots, is the epitome of restrained chic. It is no wonder that top designers love to work with ostrich leather. Its suppleness means that they can work it into any design they please, to create innovative handbags and it also takes color exceptionally well, making an infinite range of wonderful colors possible. 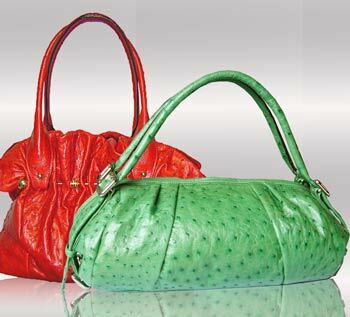 Above all ostrich leather produces bags of amazing quality that are perfect for the luxury handbag market. Ostrich is one of the more expensive leathers in the world, as genuine luxury never comes cheap. This is in part due to its excellent quality, but also a matter of supply and demand. There is only a limited production of ostrich leather in the world, as ostrich farming is a highly specialized business and there are many designers and handbag manufacturers who are ready to snap up the top quality leather as soon as it is put on the market. Find an ostrich handbag that you love, in a timeless style that will not go out of fashion, and it will be an excellent investment. These bags really do last for years, long enough to be passed down to the next generation and treasured by them too! A well-made ostrich bag can last on average 30 years, while the most you can expect from a calf-skin handbag is about 5 years of use. Ostrich leather is naturally water resistant too, which makes it more hardwearing than other exotic leathers such as crocodile and python leather. Ostriches are sustainably farmed with the traditional centre of production being the Oudtshoorn area of South Africa. There is no wastage in this farming practice, as the feathers are used both in the fashion industry and for making rather more mundane feather dusters, the meat is also used and provides a healthy lean alternative to beef and the leather can all be used to produce luxury goods. Ostriches are raised in the open with plenty of space in their natural habitat, and by their nature cannot be mass produced adding to the exclusivity of their products. When you are looking at ostrich handbags you will find that some are patterned all over with the quill pattern polka dots, while others use both the patterned skin and smooth skin for different parts of the handbag. The patterned leather is called the crown leather and is the most in demand and therefore the most expensive part of the skin. The smooth skin from the side of the ostrich has all the same qualities of suppleness and resilience but lacking the characteristic spots, it is considerably cheaper. If you want to find a more affordable ostrich leather handbag, look for bags from reputable companies that make use of this smooth leather, either for the sides of the bags or by alternating it with the patterned crown leather as a design feature. You will be able to get far more bag for your money this way and enjoy all the amazing qualities of genuine ostrich leather for years. Kit Heathcock is a freelance writer contributing to Gleni, the Italian luxury handbag maker’s website. Read more on ostrich handbags or start looking for your perfect ostrich handbag now.